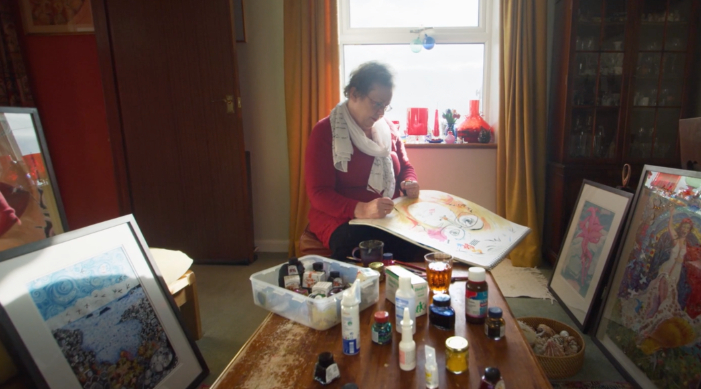 Synopsis: Painting Myself Brave is a short, elegiac like film that gives expression to Alison Chandler’s experience of a life threatening illness and how she found salvation through her painting: told in her own words – mixing narrative with magical realism and inspired by the landscape of Johnshaven. I look for a compelling story and Alison’s (and her character) really resonated with me: Her spirit, her art and her eloquence. She was willing to bare her soul. And I think deep down her experience of illness touched something raw within me in relation to my Mum and Dad. It owes a great deal to my two collaborators – Scottish cinematographer David Liddell and Keith Wright who edited the film and was made for about £1300 in all. The film was made for The Way Through Project which is inspired by the personal story of Alison Chandler – a journey of hope and inspiration through a life-threatening illness. In October 2016 she underwent emergency surgery which revealed a rare and complex cancer. Throughout 2017 Alison had a series of operations and chemo. Throughout the visits to hospital Alison painted a picture every day. “I’ve painted all my life but I have never had a purpose until now” – she said. Over the course of the year she averaged a picture every 3 days. The images are an incredible document of a journey through cancer and are compelling, personal and universal. Painting Myself Brave came about following a heartfelt appeal in late 2017 (it was filmed in 2018) from a trustee, Louise Baxter, to the director – ‘Picture a little cottage facing the sea in the picturesque north-east village of Johnshaven with a magic garden where passers by are invited to add something to it. Alison Chandler, lives here with her husband Miles. In October 2016 she underwent emergency surgery which revealed a rare and complex cancer.. Alison has just completed her 13th bout of chemo…I have attached a wee presentation of some of her work made by a mutual friend as well as some pics of Alison outside her home…I think her story could make a very special film which would resonate with many, many people. I know it’s a long shot, but………..’. Painting Myself Brave is a short, elegiac like film that gives expression to Alison Chandler’s experience of a life threatening illness and how she found salvation through her painting: told in her own words – mixing narrative with magical realism and inspired by the landscape of Johnshaven.